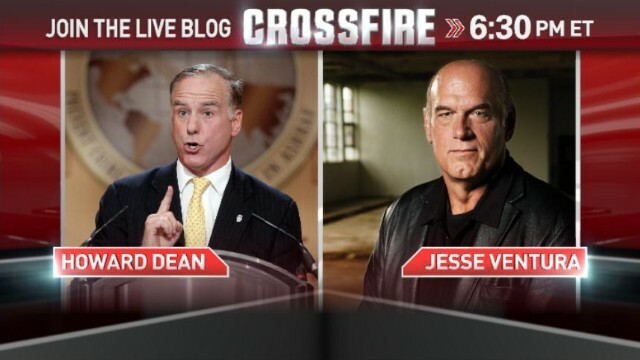 Day four of the shutdown: Former governors Howard Dean and Jesse Ventura join hosts S.E. Cupp and Stephanie Cutter in the Crossfire at 6:30pm ET. Howard Dean supports the Democrats' efforts, while Jesse Ventura would furlough both parties' lawmakers. We want you to weigh in. Do you think Americans should have to pay taxes during a government shutdown? Respond below or by replying to our tweet or commenting on our Facebook post. U spend a lot of time supporting the federal government and no time regarding those citizens who dont work for the feds. Those citizens who have children and pay out of thier own pocket for thier child's lunch and food at school. Communist get paid by the government. If the government shut down a section of the population would continue unabated. Jesse you had me until you said you'd like Howard Stern to be your running mate. Come on man give me a break! Howard Dean? Jesse Ventura? What the heck? I knew that in the government shutdown that "news" was hard to come by, but comments made by these two? C'mon! On another note: Why not just post the Communist Manifesto, and forget what Van Jones may say on any subject. His response will be a quote from it! He should have practiced a little "stealth" and he could have kept his gig at the White House working with Valery Jerrot and the gang. "Really, Really" close to the wheel house of government. Mr. Kaminsky – it would seem that you are not a "dis-interested" party on the topic of cancer treatment for children. Presumably you have suffered a loss near to you and for that all readers of this blog, I'm sure, are sorry. However, your sentiments regarding one party versus the other are not at all legitimate. You can't possibly, with any credibility, blame the Democrats for the disruption in NIH funding. It was the GOP that forced the shutdown. It was the GOP that wasn't detailed enough, knowledgeable enough to know or to care that kids experimental cancer treatments would be stopped by their action. Did you know that the GOP CUT NIH funding by $1.5B and the Democrats fought that? The GOP was hardly were thinking about sick kids. Don't you be a pawn in the debate. You should call for the Senate to have an up or down vote on the House's version of a continuing resolution funding bill. You should then call for evenhandedness . . . a HOUSE up or down vote on the Senates's version of a CFR. That would be even handed. That would be fair. That would get those children their cancer treatments and other kids their baby formula. We grieve your loss but we won't let your bias cloud the issue. I can say this because I'm not a politician running for office. Paying taxes is irrelevant at this point! Tying a purely political agenda to the necessity of a Continuing Resolution is so wrong, wouldn't even try to characterize the same for the debt ceiling. First, pass a clean CR. Then, scream and holler about political agendas, all day long. A minority within a minority is attempting to control the Nation. Can you say Bolsheviks, as in the tiny minority within the Russian Revolution that imposed Communism on the Russian Empire, by another name; USSR. They are Anarchists of the worst type. Willing to fiddle while Rome burns. Will we ever see you in a bowa and tights in a wrestling ring? Jesse was like a breath of fresh air !! I am low income($9.59 per hr.) I finally got onto the health care web page only to find out that I can not afford Obama's affordable health care. My wife and I can hardly come up with grocery money from week to week (thank god for our local food bank) and Obama's cheapest plan wants $80.00 each per month with a $4,000.00 deductable before the plan even goes into affect. We would have to take from our grocery budget for the monthly payments and if we did get sick (which you can count on) how would we ever afford that deductable ?? Obama has tied himself to a dead horse here and I think this "trainwreck obamacare mess" with pound the last nail in his political coffin. have jesse ventura on your show every day. that was great televison. Chairman Kaminsky, thank you for the noble work of your foundation, and for sharing your views...and your paients' plight...here. We will be in contact with our own representatives on your foundation's behalf Monday morning. Good luck to the kids. It chills us to the bone to know that children's lives are effectively being sacrificed by BOTH parties right now. To our general point, here: One of us is intensely Liberal and the other a staunch Libertarian, but somehow we've found enough common ground to become engaged. We even talk politics, and whaddya know? We can come to an understanding because we WANT to, and because we care about finding solutions more than we care about our egos. You could say this will pass with the end of the honeymoon, but we've been negotiating compromises together for over ten years. The fact that endless conflict serves the interests of no one, in a relationship, in government, or anywhere else is not lost on us. Neither one of us believes that either side of this current shameful failure of governance really wants to find a solution or work on their relationship, least of all for the sake of the American people. It's appalling. Despite our differeing ideologies, we've made a pact to vote as a unit from now on, only for candidates who have a proven track record of reaching across the aisle no matter which party they come from. P.S. We also want to note that though we both really enjoy watching Newt Gingrich, Van Jones, and Stephanie Cutter on Crossfire, we catch up on our DVR backlog when S.E. Cupp is on the panel. Neither of us has any problem with listening to a commentator from futher right than Newt, but we both find Ms. Cupp's persona and expressions unpleasant, disingenuous, even obnoxious. We don't think she does the voters whose views she represents any service on one of the few shows where all perspectives are given more or less equal time. We are distracted by her body language and tone when we honestly want to connect with her message. Not a good fit for CNN at 6:30 pm. Wow...great debate/show...I am a Canadian objectively watching this incredible political gridlock ...lived in the US for a year....great country!!! But NO health care for those who can't afford it....come on, if you had a catastrophic illness and were uninsured...OMG...get with the rest of the civilized world....pay for your fellow citizens...is there a better way to spend your tax dollars...please ADVISE. I have never seen an American President disrespected as I have seen Pres. Barack Obama. Early in the game let us not forget that the Republicans said they wanted to see Obama fail. They called him a liar on Public Television when millions tuned in to hear the President speak. Let us call a spade a spade. The old prejudices of white America is showing and no one wants to admit to that. There is more but too much and too little space. You must be joking. Of course Americans still need to pay taxes. Only simpletons would assert that no government operating costs occur during the shutdown. All essential service staff are still on the payroll, and they will get their paychecks retroactively after this ridiculous circus is over. You still use your roads, don't you? Well, do you think road maintenance will be cheaper over the course of the year just because government shut down for a few days? Of course not. And what about social service programs, veterans affair etc.? All those operating costs will continue to accumulate. I can't believe that was a serious question. Get rid of the Democrat and Republican parties and stop worrying about which party is going to come out on top, just become people!! president- jesse ventura vice president- howard dean , your first volunteer is here america! You need to get the whole story. There is a whole lot more too it that you don't know.. He's not suing the widow.... He's suing her deceased husband's estate, who falsely accused Governor Ventura. The estate is under the widow's name. We need a house rule that if two thirds of the house want to vote on a bill that it will over ride the majority leader. Well the democrats just killed the bill that would allow the kids at NIH to receive their clinical trial drugs. It did not matter that they have a death sentence hanging over them. They are sacramental pawns in their political party rhetoric. I am not a fan of either party but at least one party was willing to excempt these kids from their war. Unfortuantely the other party was not. The only thing that matters is who looks good or bad why its all about political power at any cost. There is no doubt in my mind that most of these elected officials have sold their souls to their parties and in doing so have lost their humanity and compassion. Cancer does not stop and these kids are not responding to standard treatments how dare they take away thier only hope, how dare they. These people are out of control and if the american people do not rise up and take back control god help this great country. Wonder what would happen if tens of million americans went online or visited their voter registration office and switched their party to independent. I am sure their loyalty would switch to the people not their dam parties. I beg you stop this madness. I wrote to both my senators and asked them to exempt these kids from politics regardless of who looks good or bad. That it was the right thing to do no matter what. Both voted to defeat the bill. I cannot remember the last time I have been so angry. I only hope there is a special place in hell for all of them. Obama should bring in the gun debate and add an a attachment if GOP ban guns he take a look at parts of Health Care?? Dear Alan, Your story touched me deeply. I myself have had an experience with cancer. By the grace of God I made it through, it cost us everything we worked for, house, retirement income, you name. But I am alive and able to return to work on a part-time basis. I spent 6 mos in chemo treatments and 9 wks in radiation. It was the hardest time of my life. The children I saw come in and out of (I got to know a few of them) treatment were an inspiration to me. No matter how down I was the children always brighten me up and brought a smile to my face. Some would talk to me and ask me questions about myself and my life. In the chemo recliner we were there sometimes for hours receiving treatment and the children no matter bad things got always had enough strength to musture up a smile for you. I will pray for the children as they should be everyone first priority. All the children represent our only hope for any kind of a future. I agree with everything you wrote and have already emailed my state representatives with no return response yet. Tons of respect, Mr. Kaminsky and good luck. Keep on fighting the good fight.